Several of you complain in the forums of MacGeneration about the problems with network drives under OS X Lion. If you use a NAS to perform Time Machine backups, you may have noticed that Time Machine cannot use your network volume. In OS X Lion In fact, Time Machine is only compatible with the communication protocol Netatalk 2.0, that do not support all NAS. 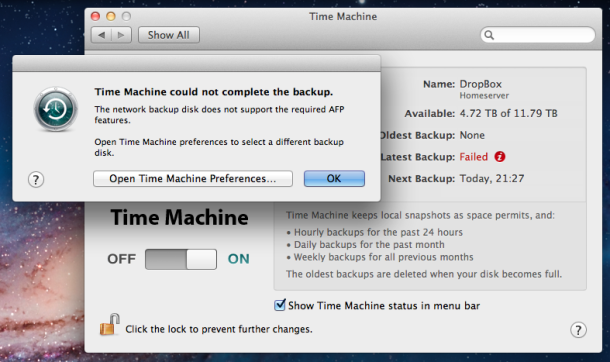 Drobo announced that the FS series would soon be updated to ensure its full compatibility with Lion and Time Machine. If you have a Synology NAS, perform the update of the latest DiskStation Manager 3.1, or go to DSM 3.2ß in case of problems. Check with the manufacturer of your equipment the arrival of a firmware update. If, however, this update should arrive soon, you can always re-access AFP, as Apple explains in a sheet.